During the highs of BatteryGate, Apple reduced official battery repairs to $29 each through 2018, down from $79. Apple has now updated the page with details of what will happen from January 1st, 2019. The prices are going back up, but not quite to the level that they were. Battery repairs for iPhone X, iPhone Xs and iPhone Xs will cost $69. Repairs for all older iPhones will cost $49. 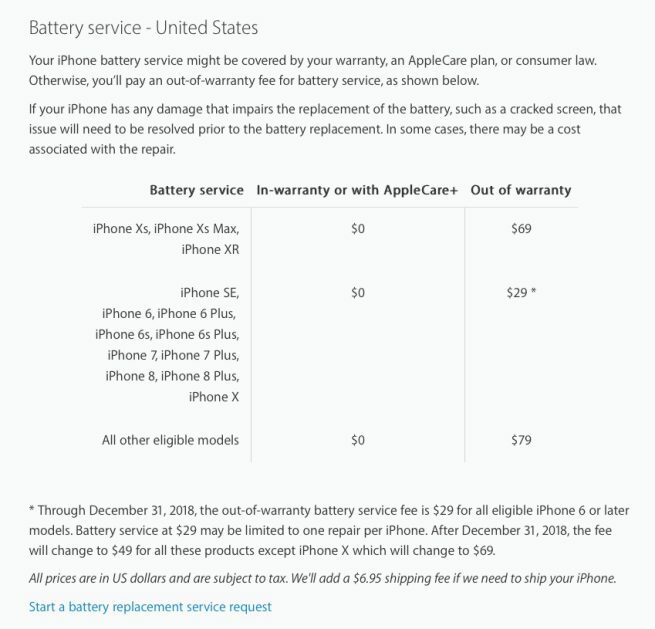 That means if you have an iPhone X or earlier model, you can save at least $20 by initiating your battery repair before December 31st, 2018. iPhone X users have the most to save as the price jumps from $29 to $69. Both the $49 and $69 price points is cheaper than the $79 Apple charged before the battery saga began. You can check the status of your iPhone battery by looking at the Battery Health statistics in the iOS Battery settings pane. Batteries with lower capacity are more likely to be dynamically throttled by the system, which can slow the device. Apple lets you disable the throttling manually but then you risk getting many unexpected shutdowns. Generally, Apple advises getting a battery repair when the capacity drops to 80% or lower. If an iPhone battery drops below 80% whilst still covered by the warranty, you can get the replacement battery for free.